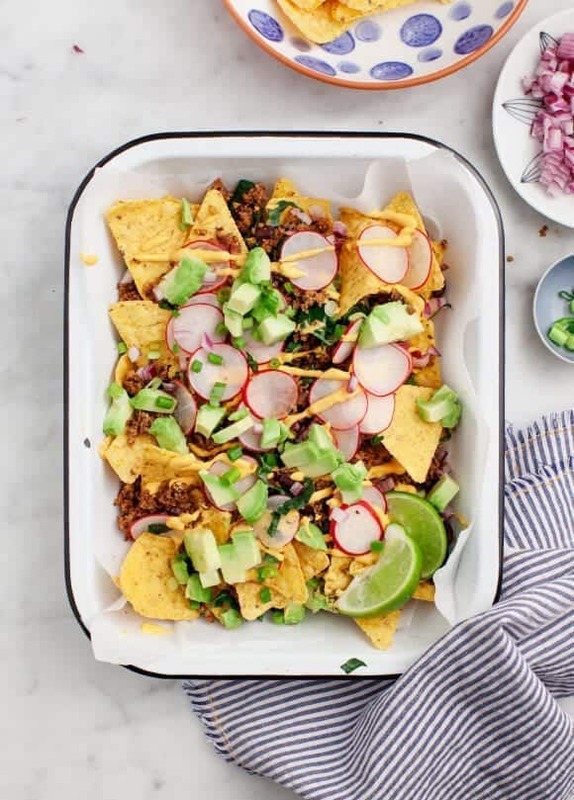 Who knew nachos could be healthy? We love this version topped with walnut-mushroom taco meat, cashew nacho "cheese," and plenty of veggies. I came home with their cookbook and every night later that week, I made nachos. 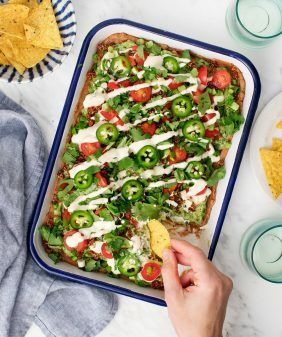 My version here is quite a bit different, but the concept is the same – pile on loads of fresh ingredients and nachos can be healthy. Or at least healthy-ish. (If you baked your own tortilla chips these would be a tad healthier). Instead of using fake-meat products, I make a version of ground taco “meat” with walnuts, shiitake mushrooms, spices, and black beans. 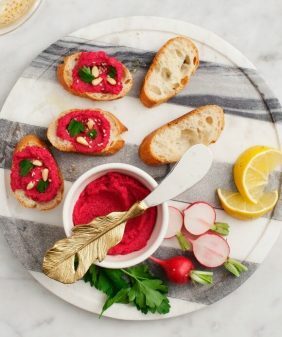 As for the cashew cream, it’s made with pumpkin puree, which gives it the classic nacho cheese-like color. From start to finish, this recipe is a bit long, but you should definitely use a few of these components for other recipes. For example, the cashew cream here was left over from the night we ate these tacos. If you have leftover taco meat, save it for, well, tacos later in the week. But lets get back to the healthy part – there’s kale in here! It’s thinly sliced and conveniently hidden in the middle layer so no one will notice. I also added a layer of crispy radishes because their crunch factor helps you get away with a few less tortilla chips. 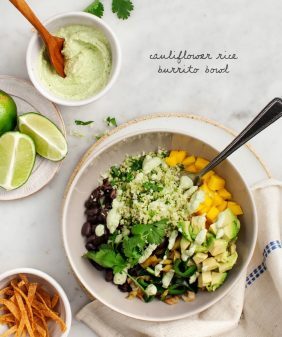 Top it all with diced avocado and a few generous squeezes of lime. Game on. No one will know these nachos are loaded with kale, shiitakes, and even more veggies. If you have extra components, save them for tacos, salads, or more nachos later in the week. 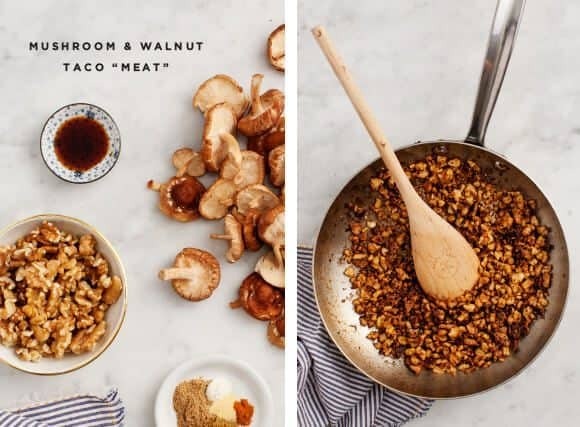 Make the mushroom-walnut taco “meat”: In a small skillet, heat the olive oil over medium heat. Add the mushrooms and cook, stirring only occasionally, until they begin to brown and soften, 3 to 4 minutes. Stir in the walnuts and lightly toast for 1 to 2 minutes. Stir in the tamari, cumin, coriander, garlic powder, onion powder, and paprika. Add the balsamic vinegar and stir again. Turn the heat off and stir in the black beans. Taste and adjust seasonings, adding more tamari if desired. 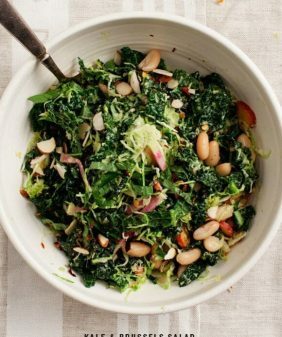 Assemble the nachos: On a large platter, arrange half of the tortilla chips in a single layer, top with ¾ of the taco “meat,” the kale, half the scallions, and half the pumpkin cashew cream. Add another layer of chips and top with the remaining taco meat, remaining cashew cream, radishes, avocado, remaining scallions, diced red onion, and cilantro. Top with a squeeze of lime juice and serve with the remaining lime slices. Serve with salsa or hot sauce, if desired. Serve immediately. If you are gluten free, be sure to look for corn tortilla chips that are certified gluten free. I am intrigued by all the fun things being put into vegan cheese sauces. The pumpkin cashew cream looks amazing, and perfect for nachos! I can’t wait to try it, Thanks! These are the ultimate vegan nachos. I like that you included black beans in the taco meat and all those spices to give it a rich umami flavor. I like crumbling up tempeh and I bet a tempeh black bean combo might be good too. Looks soo good! 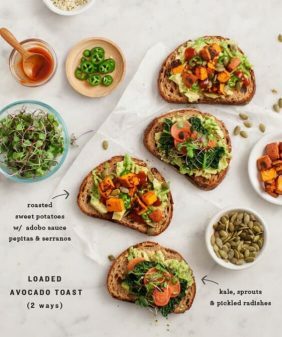 nachos are one of my favorite foods, but I’m craving vegetables a lot more than meat these days so I’ll definitely give these a try. Thanks for the recipe! This looks amazing. I’m not supposed to eat mushrooms. Do you have any ideas for an alternative? Nachos are totally my go to splurge when I’m on vacation. I love the creamy cheese and crunchy chip combo! Tried it out for Super Bowl! Thanks for the recipe, it was a hit! Hi Rabecca, I’m so glad! Oh my, those look fantastic! I know what I’m making for our movie night snack tonight! Thank you for sharing. An amazing supper. Husband loved this dish too. Took us back to ‘Indie Joe’s’ Mexican restaurant, in Leeds, around time we first met. The taco ‘meat’ was so delicious and filling. 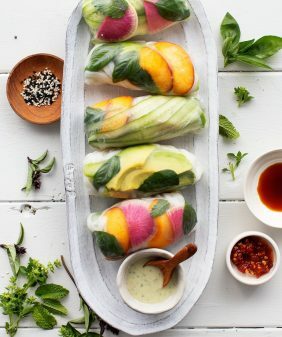 A brilliant idea that is clever and every ingredient just works together beautifully. Thank you! So glad I came across this! I’m a sucker for nachos and since and this reminds me of my college days. I appreciated how you put your own little twist to the dish. I can’t wait to make this! Thanks! Don’t want to be a hater, but having to click through two sub-recipes to get all the info on the cashew cream was real annoying. In the future, it might be worth just re-creating the recipe in one place. These look delicious except I don’t like mushrooms. 😉 Any suggestions how I could adjust the recipe to make it without? Thanks! My partner said this was one of the best meals he’s ever had. He absolutely wolfed it down and kept saying how delicious it all was. Takes a little bit of enjoyable effort so, so, worth it. Want to make it all over again.Thank you for such a truly inspirational National Nacho Day recipe!